Just because you’re a dividend investor doesn’t mean you’re fated to “grind out” income 3% and 4% at a time. With a slight change to your current (dare I say pedestrian?) 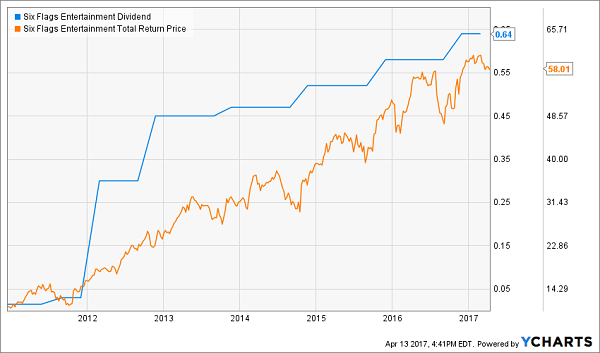 strategy, you can keep your dividends and enjoy 81% to 437% price upside or more. These types of life-changing returns are easily achievable within a few years. You just need to employ the “ultimate contrarian dividend strategy” – and buy select born again payouts. Only buy them when a cheery outlook is guaranteed. Contrarian investing works because it capitalizes on over-negative sentiment to find value. In the income world, this means buying when yields are abnormally high – and prices abnormally low – thanks to popular yet incorrect beliefs. Corporate bankruptcies can be particularly profitable events for strong-willed because they extinguish any and all hope. And here’s the best part – we don’t even have to invest during the depths of despair. You and I can wait a few years until a successful turnaround is basically guaranteed. And we can still bank triple-digit returns then, with less risk than a typical stock purchase. All thanks to the shame that lingers longer than it should. While firms may emerge from bankruptcy in a matter of months, the associated stigma can last many years. An academic study published in the Journal of Finance studied the stock returns of 131 firms emerging from Chapter 11 bankruptcy – and found they outperformed the broader market over the next 200 days by a large margin. Another study published by the International Journal of Business and Social Research studied 59 companies filing for Chapter 11 protection. It also found that these stocks beat the market handily over the next 250 days. There’s nothing special about the 200 or 250 day threshold the academics picked. The stocks they studied crushed the market for the simple reason that they were “too cheap” thanks to the bankruptcy black eye they carried. But I’m risk averse – and I’m not interested in buying firms as they emerge from bankruptcy. I only want to buy stocks in companies that are going to make it, so that I can hold them for many years. I also want them to pay me a dividend. How do we know when a turnaround is working? Simple – management reinitiates the dividend. Let’s take the case of legendary REIT (real estate investment trust) CEO Bruce Duncan, who inherited a mess at First Industrial Realty Trust (FR). His first order of business when he took the helm in 2009 was to eliminate the firm’s dividend to preserve cash and pay off debt! First Industrial leases distribution centers. And Bruce, as he described it, went “back to basics.” He had his team focus on increasing occupancy across his current facilities. Then, he started raising the rent on his tenants. Theme park provider Six Flags Entertainment (SIX) similarly found itself in trouble in 2009, and filed for bankruptcy. The firm cleared its debt load, brought in a new CEO, and soon reinitiated its dividend in 2011. The result? 437% total returns for investors! A new CEO. In my experience, a new leader (and new way of thinking) is essential. Low or no debt. Most distressed firms simply owe too much money. A new dividend. Preferably one that is starting on an upward trajectory. As you can see in our examples, you could have bought these stocks anytime after their dividends reappeared and done quite well. 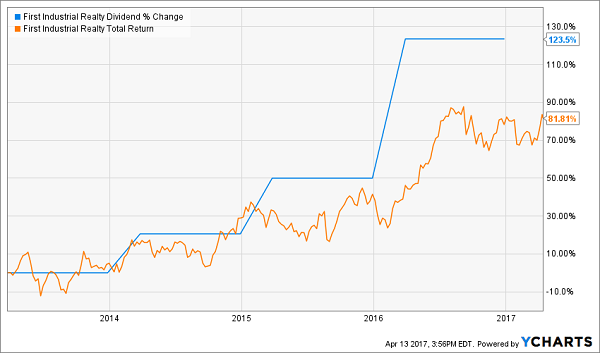 How much money should you allocate to dividend growth – which includes the “reborn” variety? This combination of rising dividends and capital appreciation is what gives you the potential to earn 20% or more on average with almost no effort or active investing at all. If you achieve returns of 25.3%, you’ll double your money in less than three years. So if you haven’t been following this strategy, why not? The best time to get started is right now – before the seven dividend growers I mentioned begin to move. Click here and I’ll share their names, tickers and buy prices with you right now.